News of a serial laundry-room “poopetrator” at one of the world’s finest institutions of higher learning has the campus on high alert. (“The fact that this could happen at Yale is shocking to me,” one student said yesterday. “Think about what this means for our community.”) But because this is college, it also means public art. Or something. 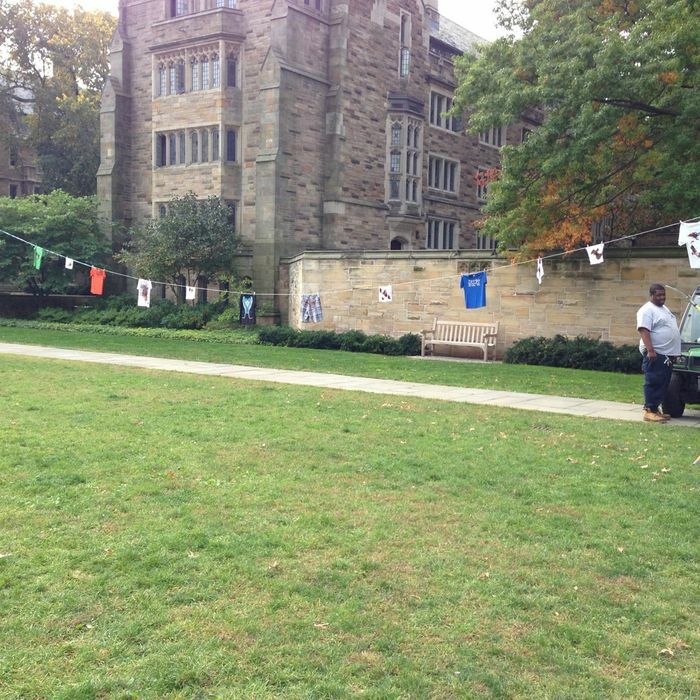 A laundry line of soiled T-shirts, pants and towels appeared outside of Berkeley College last night. At 3:35 a.m., students received an anonymous email from the alleged “poopetrator” alerting students to the bizarre display. No word on whether the clothes are actually soiled or artificially browned. The anonymous insane person, or bored prankster, added in a follow-up, “It’s still a good morning!” Don’t these kids have work to do?